Scientists can then use this method to identify gaps in knowledge and the most relevant test methods, which can increase testing speed, lower costs, and reduce animal testing. Chemicals that could potentially cause asthma through an immune reaction could be better identified with human cell- and computer-based test methods, according to a new research paper co-authored by the Physicians Committee’s Kristie Sullivan, M.P.H., in Applied In Vitro Toxicology. Chemical respiratory allergens are chemicals that cause a serious immune reaction known as respiratory sensitization. Sensitized individuals experience coughing, wheezing, difficulty breathing, and obstruction and hyperreactivity of the airways that can worsen upon repeated exposure. Workers in the cleaning, painting, construction, and hairdressing industries are most at risk, but consumers may also be exposed to chemical respiratory allergens and become sensitized to these chemicals. The Center for Disease Control and Prevention estimates that up to 18.4 million adults in the United States have asthma, and up to 25 percent of those cases could be caused by occupational exposures. Due to the severity and irreversibility of chemical respiratory allergy, identifying allergens is of considerable public health and socioeconomic importance. Currently, there are no standardized or regulatory-accepted test methods for detecting these chemicals. 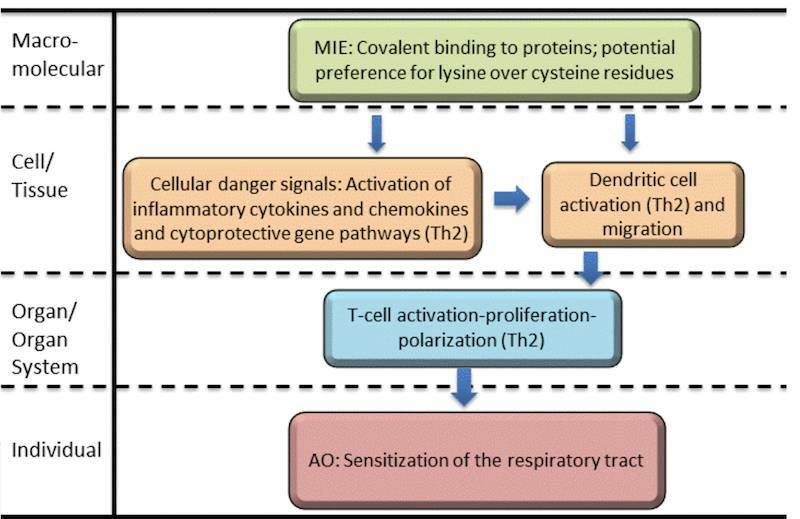 Sullivan and the paper’s co-authors have developed an Adverse Outcome Pathway (AOP) to explain how these chemicals sensitize the respiratory tract and highlights potential tests which could be used to identify them. An AOP is an organized collection of existing data on how exposure to a particular chemical may trigger a series of biological changes in the body resulting in illness or injury to an individual (human or animal) or population. Scientists can then use the AOP to identify gaps in knowledge and the most relevant test methods, which can increase testing speed, lower costs, and reduce animal testing. “The immune and respiratory systems of mice and rats react differently to chemicals than human systems do, making it difficult to detect chemical respiratory allergens and prevent people from developing these reactions,” says Kristie Sullivan, M.P.H., vice president of research policy for the Physicians Committee. “This AOP will help speed the further development of computer-based and cell-based tests that could be used to detect chemical respiratory allergens and lead to the regulatory acceptance of nonanimal approaches."